The Sliver is a well built machine with some handy features but the poor battery life, stiff keys and no Ethernet port let the side down. The Sliver is an ultraportable laptop that offers the great style, but compromises have been made to achieve its tiny size. This is a visually pleasing laptop and the machine looks fantastic from all angles. The small form factor also makes it a very portable machine, ideal for those needing to work on the move a lot. The portability of the machine however is slightly let down by the very average battery life, at only 143 minutes you'll need to carry the charger around with you on long trips. Those after an excellent battery life should consider the Acer Aspire 1410-74G25n instead. Had this laptop been powered by a CULV (Consumer Ultra Low Voltage) processor similar to the Acer's, both battery and everyday performance would be much better. As it stands, an Intel Atom processor – normally found in netbooks – has been employed, and its benchmark performance shows it's better suited to office apps. 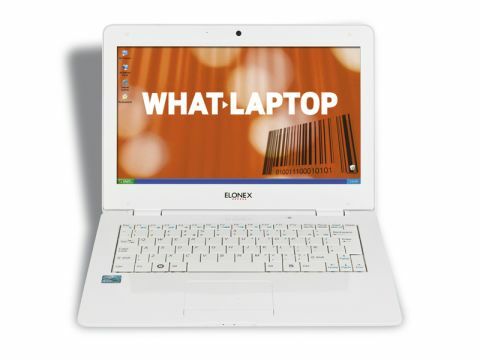 However, this is the only machine to feature the Windows XP operating system, which is much lighter to run than the newer Windows Vista and 7 operating systems and, despite the results mentioned above, we found the laptop to be fast in running basic programs such as email clients and spreadsheets. The laptop's 12-inch screen is excellent and, although it shares the same 1366 x 768-pixel resolution as all the other machines at this price point, it provides sharper and brighter images than most, helping photos and films look great. The machine is well built and doesn't attract the fingerprints that plague its shiny peers, although it isn't as strong as the Acer Aspire 1410-74G25n here. Dust does quickly show on its white surfaces, however. The keyboard provides average performance, with the keys being quite stiff to press. To save space some of them have also been reduced in size, which feels cramped and takes a little getting used to. While 802.11g Wi-Fi is fairly standard across the group – the Acer being the exception – this is the only machine here with no Ethernet port, meaning you can only connect to networks wirelessly, which won't suit everyone. As with the Lenovo G550, there is no media card reader and only an HDMI out, which is bad news for those with older monitors with VGA connections. The Elonex Sliver is a mixed bag, but while it does have its issues, if you're after an attractive machine for browsing the web and writing the odd email, this is a great option. Those after more bang for their buck, however, would do better opting for the Acer Aspire 1410-74G25n.